Been thinking about going to AMES PERFORMANCE TRI POWER PONTIAC NATIONALS, but having a hard time picking a class. any idea what was the slowest qualifying ET for the quick 16 was last year? Both Super Pro and quick 16 are full tree .500 ET where I usually run .400 pro tree 8.000 index. Last edited by Glenn Lever : 07-23-15 at 01:21AM. Was runner up in the New England Hot Rod reunion last fall, was runner up two weekends ago At the bowling Green Hot Rod Reunion. 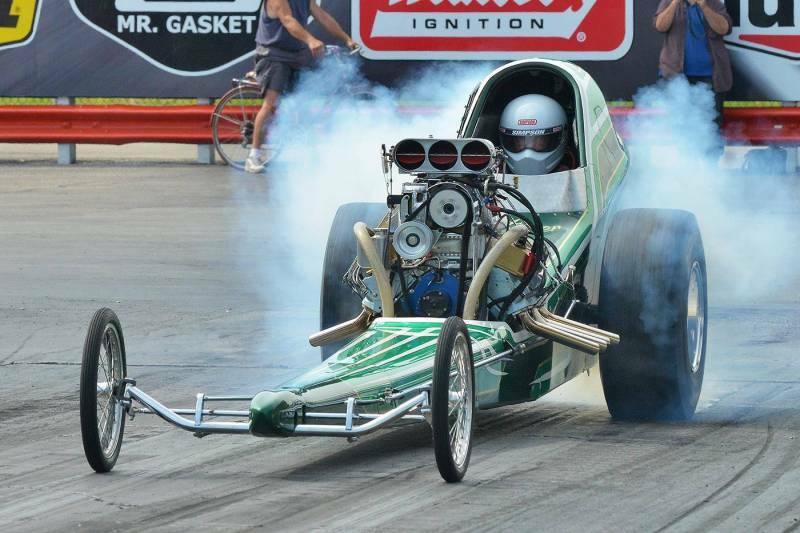 Turned the red light on in the first round of eliminations at Norwalk last weekend, but ran an 8.006 on an 8.000 index. Will be racing this weekend in the Empire Gold Cup. Would like to run the AMES PERFORMANCE TRI POWER PONTIAC NATIONALS but not sure there is a class for me (run usually with a .400 protree and trying to switch to a .500 full tree might be an insurmountable problem. I have been running a 8.000 index, calculated HP is 740 HP, on the dyano it ran 713. 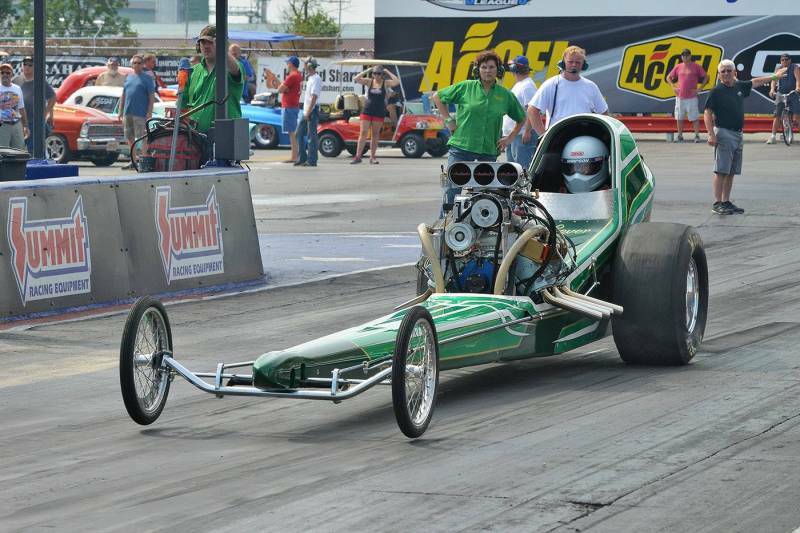 I would like to run 7.500, using Wallace Racing Calculators, I think I will need 913HP. I can get that by dialing up the blower (currently running 28% under driven with a 95 pill). and reducing the size of the bypass pill (more air and fuel). The block was carefully picked, no undercutting of the mains, I have a valley brace. The block was a RamAir III which means it has stock four bolt mains. There is nothing else stock inside, all good stuff. That's amazing with the stock block! Below is the tentative Lever Family Racing Schedule. You will note there is nothing in the month of June as we are planning a trip out west in that month. We might try and squeeze in something at Empire in that month before we leave. Nostalgia Rendezvous 700 Raceway Blvd. Hot August Nights 700 Raceway Blvd. It has been a whirlwind here in the Lever household the last couple of days. It all started with a trip to Matt’s shop to drop off some used oil. See the last entry under the biggest news. I have contacted Dan of Dishon’s Transmissions, a contributor on my forum. He has agreed to build the Turbo 400 for Anne’s gasser. We had Paul Francia (Known as Uncle Paul) over. He was a wealth of knowledge. He entered all the locations and pertinent information into his Four Bar program. We learned that the bars needed to be set up completely different from what they were. With the current set up, there is lots of adjustability to the instant center of gravity. With the new configuration of the bars we have 98% Anti Squat. At Matt’s shop, I was introduced to Walter Cotturone who is also into Pontiac engines. He informed me that Butler had a sale going on, on their aluminum block. $600.00 off was quite an enticement. I am currently at the limit of the stock cast iron block in the dragster and everyone knows what happens when you run at the limit. It comes with keyed steel main caps studs and the outer bolts are splayed. I thought I had on hand all the internal components to build a 428 Pontiac blower engine. So…we are off to the races, many phone calls, text messages, and e-mails later and we learned that we were not as close as we thought. My Venolia Pistons will not work in the Aluminum block as they are for a 4.155 bore and the sleeves in the aluminum block start at 4.250 (pistons are too small). Butler informed me their aluminum block comes machined for a 50MM cam so the cam I have will not work (but wait, read on). Upon questioning, it was found out that the drive shaft for the oil pump in the aluminum block is an inch longer than stock and costs $32.00. I looked them up and called the number on the web site. I ended up talking with the owner Frank Gostyla. 1) The block comes as a dry deck; no holes for the water jacket in the block to the heads. There are extra ports in the water jacket from the block to allow running lines from those ports to the rear ports on the heads. Or the deck can be drilled to allow normal water passage. Current thought is to retain the dry deck. 2) The freeze plugs in the side of the block are threaded and require a threaded plug. 3) Frank offers the aluminum blocks with either the stock bore for the cam or the 50MM bore for the roller cam bearings. 4) These blocks are not on the shelf, but currently being cast. Lead time is currently 5 to 6 weeks. 6) Deal is done now. We are in like Flint, right, just wait, are you kidding? This is hard luck Glenn. My internal parts were purchased a long time ago for a blower engine that never got built. So those parts have been on the shelf a long time. Now I’m going through them and learning their fitments. The thing to note is they say hold up to 850hp which will not work. “RPM International offers three distinct types of crankshafts—Cast, 4130/5140 Forged with Nitriding, and the SAE 4340 Forged with Nitriding, which is our top of the line. As I have the 4340 crankshaft, how can it be rated for only 850 HP? I asked that question and received this answer. So right now it looks like the pistons absolutely will not work, the Crankshaft is not going to work, and Frank of AllPonitac says I should consider a longer rod to get a better rod length to stroke ratio. Anyone want a complete brand new in the box rotating assembly (Venolia rods and Pistons RPM 4340 Crankshaft) for a 428 Pontiac? out in Brownsburg, IN (same town Keith Burgan is from builder of the dragster). Freedom Racing Engines is a supporter of NDRL the racing series that we race in. He has agreed to assemble the engine, look at all the misc parts and make a cohesive engine. This engine will easily put us into the 7.5 class with room to go to 7.0 and have the engine live a happy long life.